The recently restored Sandy Beach Bridge at Russells Point Harbor is a popular historic attraction at Indian Lake. For sale at the bridge lighting event will be globe lights that covered the previous lights on the Sandy Beach Bridge. Proceeds go toward Historical Society projects. 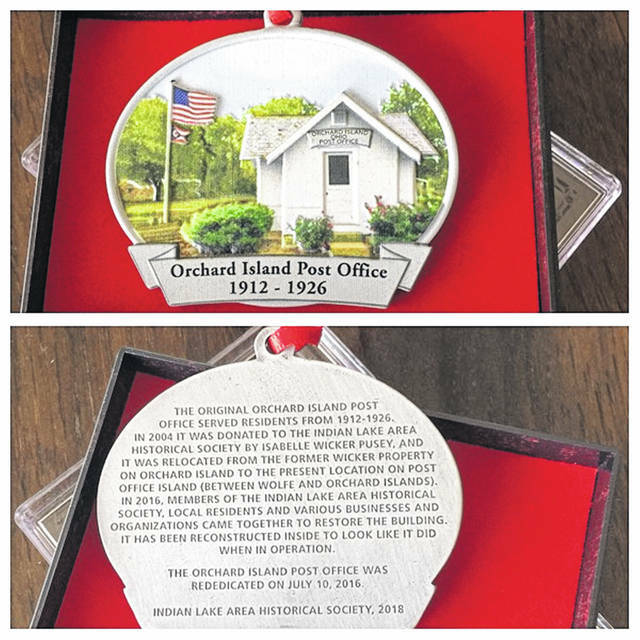 The 2018 ornament offered for sale is a depiction of the Orchard Island Post Office. The ornament fundraiser was started 4 years ago to help raise funds for the Historical Society. RUSSELLS POINT – This year marks the 3rd annual Indian Lake Christmas Tree Lighting at the the Sandy Beach Bridge, an anticipated community tradition and iconic event at the Lake. And you know what they say about the third time. It’s always a charm. And that certainly will be the case this year for sure. “This year will be our biggest and best event so far,” said Julie Schrader, a trustee of the Indian Lake Area Historical Society and event organizer. First of all, the big news this year is the installation of all new LED lights for the bridge, thanks to the May 2018 Uncorked Event fundraiser and a generous contribution from an anonymous local donor. 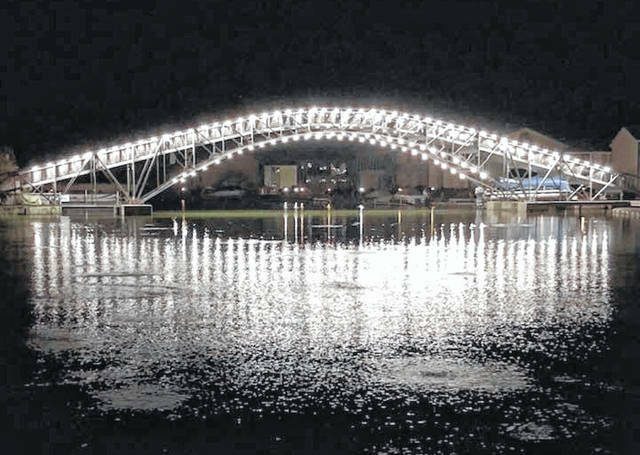 “These new LED lights will provide a much better illumination of the Sandy Beach Bridge at night and also create a more dramatic and enchanted reflection off the water,” added Sharon DeVault, a trustee of the Historical Society and event organizer. Pastor Jim Ellington, of the Indian Lake Community Church, will be the host for the event. An ensemble of the Indian Lake Middle and High school students, under the direction of Joyce King, will entertain with Christmas carols. The Donut Shop will be open for the event, selling Christmas cookies and hot chocolate. Also, the Historical Society will be selling their 2018 ornament and engraved light globes from the bridge. This year all activities will take place on the “Taco Bell” side of the Sandy Beach Bridge at Russells Point Harbor. Accessibility Parking will be provided on the access road behind the Dollar General. The Christmas tree at the very top of the bridge will not be lit until that evening. The bridge will go dark a week before the event to be relit along with the lighting of the tree. Sponsored by the historical society, the tree lighting will kick off the Christmas season, striving to engage the whole Indian Lake community to gather for the celebration. “We wanted to do something special for the community to celebrate and kick-off the holiday season,” said Schrader, who was instrumental in the creation and development of this new tradition which started back in 2015. Two exciting new collectibles will be on sale at the bridge/tree lighting event this year. Both a 2018 ornament depicting the Orchard Island Post Office and a limited number of bridge globe lights will be offered at the event this year. The ornament fundraiser was developed four years ago to provide funds for the Historical Society’s projects. The Globe Lights are the actual globes that covered the original lights that had been installed on the Sandy Beach Bridge for the past 3 years. 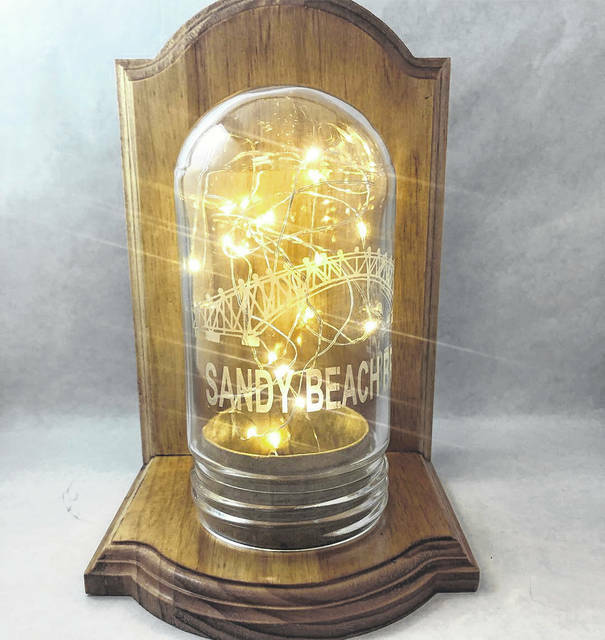 Etched into each Light Globe is a design of the bridge and the words “Sandy Beach Bridge.” The Post Office ornament will sell for $20.00 and the Light Globe will sale for $25.00. Last year’s ornament was the “Our Lady of Fátima” ornament. “It’s was the 100th anniversary of the Miracle at Fátima, which the ornament celebrated. The very first ornament was a replica of the Sandy Beach Bridge and in 2016 it was a directional Indian Head sign. The bridge lighting event is organized every year by the Indian Lake Area Historical Society Trustees and the Bridge Committee. “This event has always been well attended and support by the community of Indian Lake,” said Trustee DeVault. The weather has even cooperated very nicely with snow falling just as the tree and bridge are lit,” she adds. Once the Christmas tree goes up, the popular foot bridge, which was restored in 2014, will be closed until next spring.